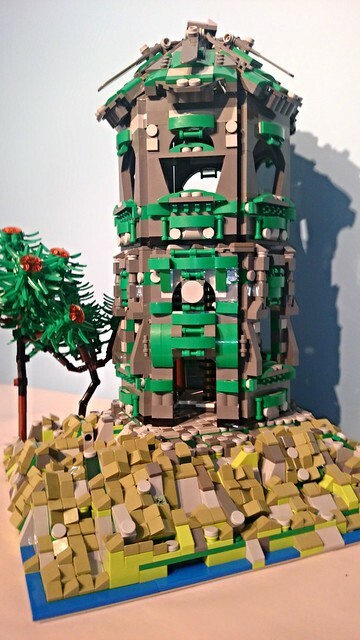 I like towers; I like building them. There’s a lot of appeal to their height and for me, the way they go straight up is really helpful since I’m incapable or unwilling to plan ahead (I can make good arguments for both…) So just building up is ace. 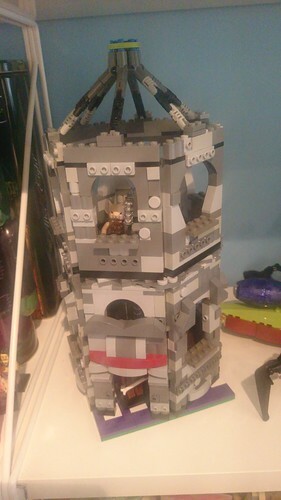 I’d seen some clever ideas about making towers when I built Lego 9472 Lord of The Rings: Attack on Weathertop. It’s a lovely little build in its own right, and I was taken with the use of hinges to join it all together. I’d previously experimented a bit in the Ogre’s Tower which turned out well, but I had a new reason to try. I’d been inspired by issue 12 (?) of Blocks magazine, which has a lovely feature on making staircases. 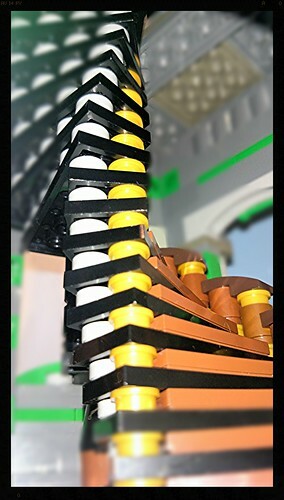 I liked the spirally ones, so I had a notion of a tower with a staircase in the middle. I semi-chose a hexagonal structure to build around it. I cannot tell you how many times I smashed the ridiculously fragile staircase apart. It became annoying. In my current preference for asymmetry, I kept going with a worn, rubbly look. But it proved to be deeply unsatisfying. Added to that I reached the top and finally clicked that I’d have to make a roof for it. Oh god, a hexagonal roof. Why, what had I done to myself? Unhappy, annoyed. I took it all apart again and reviewed my brick inventory. 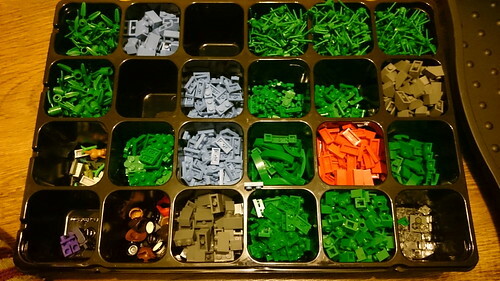 The Lego Shop Pick-A-Brick a few months ago had a glut of lovely smooth green bricks. I got many. I think my fear of symmetry is born of a worry about running out of bricks. It’s daft because 1) I’ve got quite a lot of Lego and 2) I can get more Lego. Thus re-educated I went for strict symmetry for all sides, with the exception of the door side and the one opposite (because I did run out of those bloody arches). I ended up with something vastly prettier than I had intended. Right up the very end though, even after making the scenery I still hadn’t figured out how to do the roof. 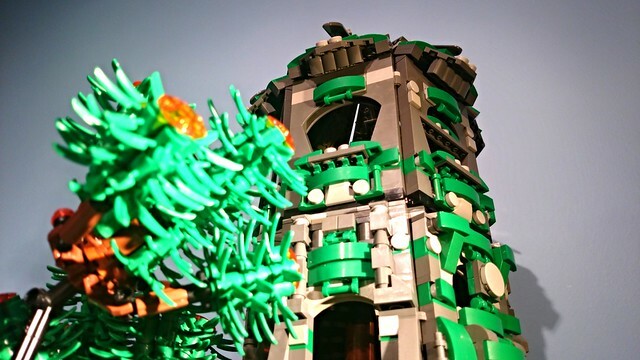 The best I came up with was brick built leaves as seen below. It’s okay, but was rather chunky and I didn’t have quite enough 2×2 slopes in the colour I wanted. I ordered more; they failed to arrive. I changed the plan. 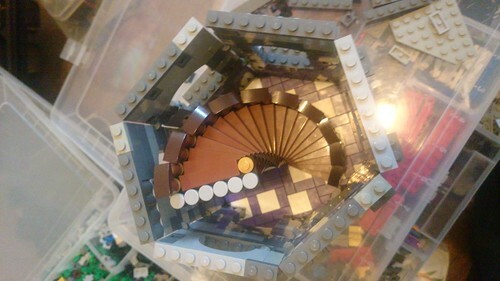 I did have 12 old grey space Lego wings, horribly discoloured but they made the same shape with less mess. I completely covered them up with Technics helicopter blades and skis! There’s still a gap at the top which I’ve found frustrating and just covered up with my sole 3×3 grey plate. Obviously most of the tower’s sides look kinda the same, but I think there’s a shot of each side in the Flickr album below. 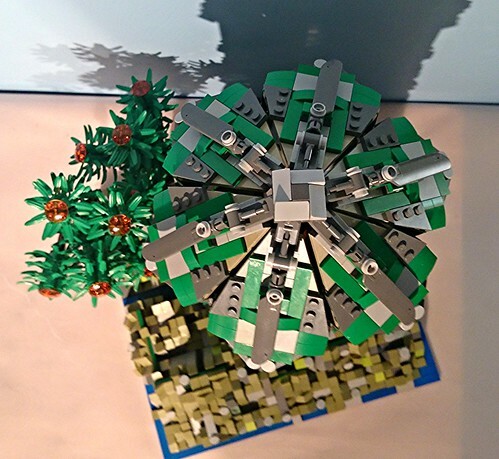 For the base (it’s a standard 32×32 baseplate) I’ve used up every olive green 1×1 slope I possess… Some of the jumbled shapes are formed from slopes hinged at different angles to create as much chaos as possible to contrast with the strict lines of the tower. I’ve also got the rebuilt pattern of the floor spilling out into the rubble which made me quite happy. 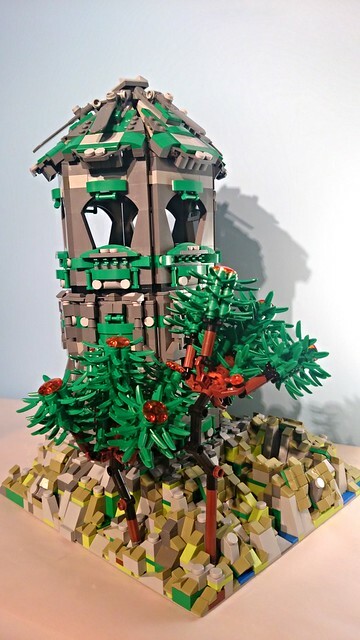 I think my very favourite thing, apart from successfully roofing the damned thing are the trees. I’ve not been successful in finding many great ways to combine foliage elements, but gazing at my neatly sorted boxes of bits tickled my building brain into action. It’s robot arms, plus plugs, palm tree tops and Technics bits. The leaves are all upside down and I had the perfect number of transparent orange upside-down tiles to top each of them and make them look suitably alien.